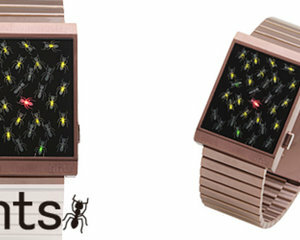 The Ants Watch is perfect for those times when you want to know the time, but don't want to risk anyone else figuring it out. Its unique ant-covered LED display is easy to read with a little practice, but absolutely indecipherable if you haven't seen the guide. This isn't just a novelty, though- a premium stainless steel construction, clean design, mineral crystal face, and accurate quartz movement make this as legtimate a timepiece as any other. Makes a great gift for the entomologist in the family, or works as a fun way to make your insectophobe friends (sorry, can't resist) bug out.